The Polish Cleaner Production Movement Society is a non-governmental organisation (association), co-ordinating the Polish Cleaner Production Programme, which has been started in 1989 within CP World Programme of UNEP-Industry and Environment Division. We promote and implement in Poland the Cleaner Production strategy, which focuses on prevention of pollution. More generally speaking, we promote Sustainable Consumption and Production, as well as Corporat Social Resoponsibility (CSR), including UN Global Compact principles. We act all over Poland. Our activities are co-ordinated by the Polish CP Centre in Katowice (Silesian Voivodeship, southern Poland). We have also regional branches covering other Polish voivodeships. 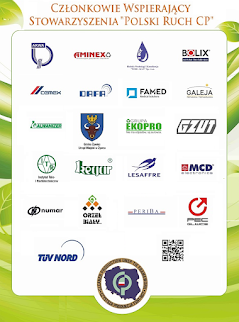 We are member of the Polish Federation of Engineering Societies NOT and Silesian Network of NGOs. Our beneficiaries are mainly companies (including SMEs), but also municipalities and other institutions. Our members and co-operators are environmental experts, industry practicioners, academics and other environmnetal enthusiasts. Our activites cover information and education (e.g. internet websites, social media, environmental magazine, trainings, conferences and other events), consultancy and implementations. For more info see post "Our activities". We use logo being the official Polish version of the UNEP's Cleaner Produciton Programme's logo, with colour changed into green and with the Polish flag added in the middle (see figure below).